I think I heard on the local news this past week that July's First Friday weekend ridership was over 76,000. Does that sound right, Dave? FangKC wrote: I think I heard on the local news this past week that July's First Friday weekend ridership was over 76,000. Does that sound right, Dave? which had a daily ridership total of 17,267. 19,181 is almost the total all-day capacity of what we had running that day (four vehicles from 4-9pm, three the remainder of the day). In short, every vehicle was full on almost every run, all day long. Nobody uses the streetcar, it’s too crowded. For comparison sake, what is the average daily and weekly ridership for the bus system? FangKC wrote: For comparison sake, what is the average daily and weekly ridership for the bus system? DaveKCMO-- is there any hope for revisiting w/ the 1 KC Place property owner to get a shelter installed at SB Metro Center? Probably not until the ownership changes. ^Odd current owners don't want it as when it rains some shelter directly along the building. We’re getting close to the one year countdown on the new trains. Of worst yet, go two places using it and get counted four times. 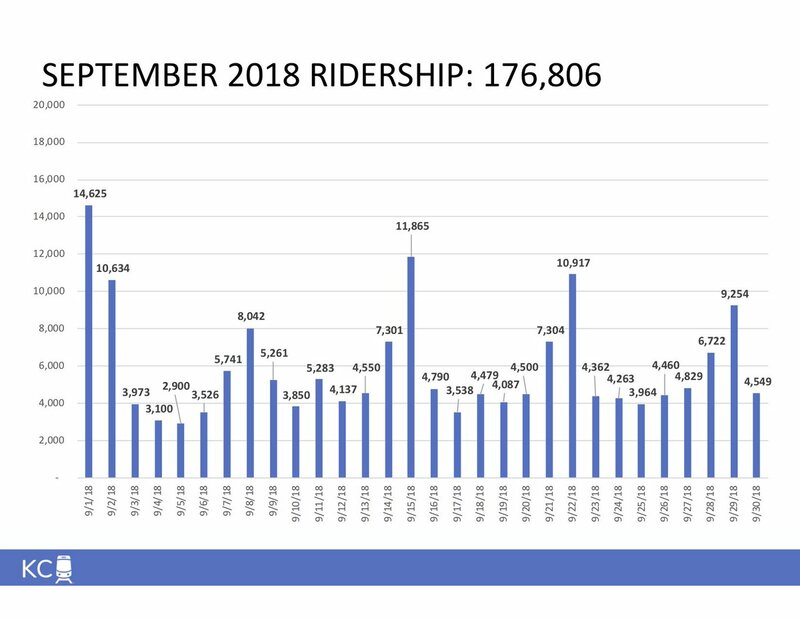 Summer ridership compared to last year..
Great numbers. Curious if the 2 new cars they're adding will increase the numbers even further. Anyone have good insight into the expectations once the 2 additional cars are added? More cars running at same time with shorter wait times might grab more that just go to the next stop vs walking. I usually walk in those cases if not seeing a streetcar but will wait for it if not far from stop. And of course during busiest packed periods/events, it should usually mean more riders per hour. Probably some exceptions where it won't make a difference. Supply/demand factors for the day. And of course more events, hotels and growing population will impact usage. BTW I was in Atlanta recently and downtown streetcar was completely dead at lunch time now that they charge to use. Was free at first. I would expect the system will be easier to ride for about a year and then quickly return to being packed. The convention hotel alone would only need to hit ~20% usage on average and that's about a train full of riders. With all the projects coming they all will add up quickly. If this keeps up don't be surprised if the system runs five trains full time not because they want to but in order to keep up with demand. One big thing that hopefully changes over time is to not have the train fill at Union Station to the point you can't get on at later stops. Increasing the weekend parking costs there is probably needed and move to a validation system based on purchase. Would help spread the load out more. Would think at this point if any month has lower ridership than previous year it would be due to fewer events for the month, bad weather or operational issues. The steady rise of downtown population and hotel rooms should otherwise increase ridership, more streetcars added or not. Would be interesting to see study on scooter impact. It streetcars were not free to ride, would think scooters would hurt ridership. But given streetcar free, does scooter presence complement or compete with streetcar? Would think a little bit of both and mostly cancels out impact. When streetcar extends to UMKC, would expect scooters to complement streetcar more than compete. Says delivery mid 2019. That sounds like June to September to me, which is in line with expectations.